Located near the corner of Immokalee Road and Randall, Station 10 services the communities of Twin Eagles, Orange Tree, Waterways and the surrounding estates area. The protection class in this area, if your home is less than five road miles from Station 10, is a 3. 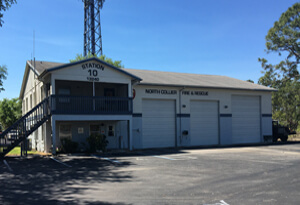 If your home is more than five road miles from Station 10, the protection class is a 10. Located near the intersection of Immokalee Road and Everglades Boulevard, Station 12 services the eastern portions of the District, including much undeveloped land. The protection class in this area, if your home is less than five road miles from Station 12, is a 3. If your home is more than five road miles from Station 10, the protection class is a 12. Station 40 is located at Goodlette-Frank and Pine Ridge Roads. This station services the industrial area off Pine Ridge Road, the entire corridor west to east between the Gulf of Mexico and Airport Road and north to south from Orange Blossom to Creech Road. 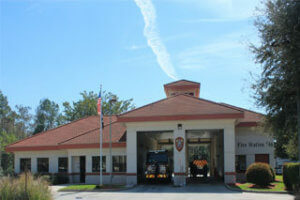 Station 42 is located east of I-75 on Immokalee Road. This station serves I-75 at Mile Marker 111 as well as the communities of Quail Creek, The Strand and Oakes Boulevard Estates and surrounding area. 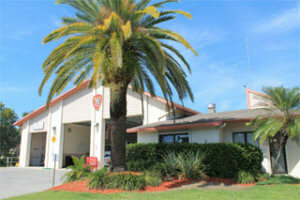 Because of the station’s northeast location within the District, it also serves as mutual aid for the Greater Naples Fire District. 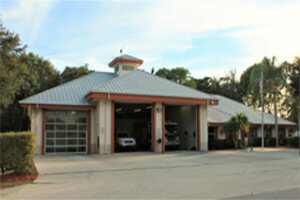 Station 43 is located off of Vanderbilt Drive, south of Bonita Beach Road. 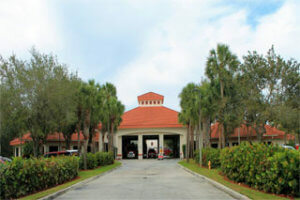 Communities included in the service area of Station 43 include Lely Barefoot Beach, Audubon and Bentley Village. 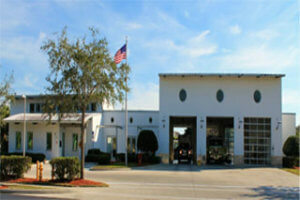 Station 44 is located within the community of Pelican Bay on Hammock Oak Drive. This station hosts an engine and ladder truck as well as a Beach Patrol Response Team due to its close proximity to the beach. 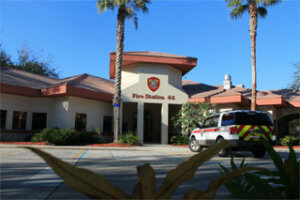 Station 45 is located adjacent Veterans Park off of Immokalee Road. This station hosts the Administrative Offices for the District. Because the station is centrally located within the District, it houses the Technical Rescue Team and the Hazmat Team. 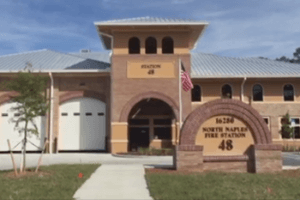 Station 46 is located on Pine Ridge Road near the I-75 interchange, and services the I-75 north and south bound lanes and all the neighboring areas including The Community School of Naples and the community of Kensington Park. 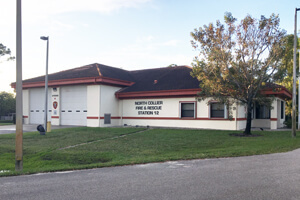 Because of its location, this station also provides mutual aid to the Greater Naples Fire District to the south and to the east. Station 47 is located south of Pine Ridge Road on Airport-Pulling Road. 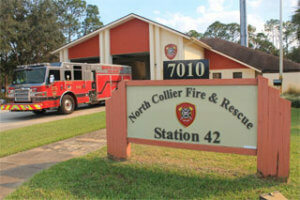 This station houses both Greater Naples Fire and North Collier Fire personnel due to its location on the border between the two Districts. Opened in July 2015, the District’s tenth station services the communities of Talis Park, Imperial, Mediterra and the surrounding areas. 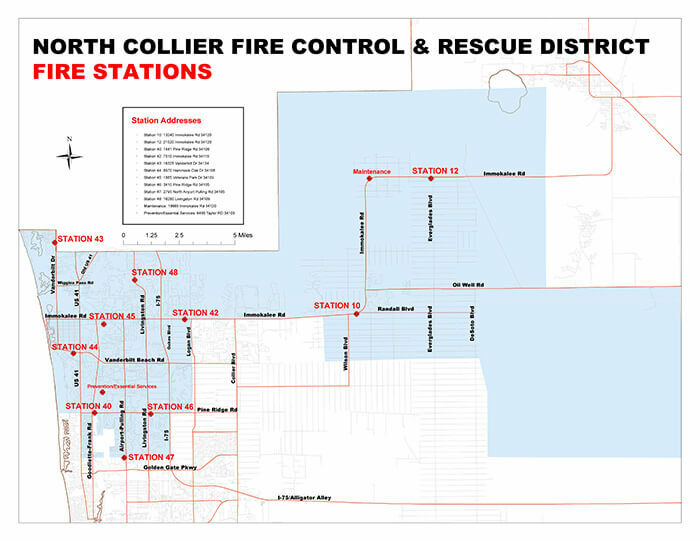 The North Collier Fire Control and Rescue District is comprised of 264 square miles including coastal beach, urban residential, rural residential and uninhabited wildlands. The area is serviced by 10 fire stations, an administrative headquarters located at Station 45 and a Support Services facility, including our Life Safety & Prevention Bureau.